NORTHERN LIGHTS, or the aurora borealis, are shimmering lights that shine above the Earth near the geomagnetic North Pole. The lights, often bright enough to read by, are usually green or red. The phenomenon is caused when a solar storm discharges high-energy particles that are channeled into a ring by the Earth’s magnetic field. The solar particles energize atoms in the thin ionosphere, which cause emissions of light. The solar particles travel from the sun in a field called, at different stages, a plasma or solar wind. Because the solar wind and the magnetic field of the Earth are constantly interacting, the northern lights may appear as an arc, a curtain, or an undulating sheet. When the electrons from the sun excite oxygen atoms, those atoms glow green. If they get extremely excited, red is the color produced. Blue and violet lights result from interaction with nitrogen radicals, a pink glow comes from neutral nitrogen, and excited hydrogen shows as blue and green. Each color glows at a particular altitude as well. Thus, the auroras can actually serve as a map of the composition of the ionosphere. The aurora borealis usually glows from 50 to 100 mi (80 to 160 km) above the ground, but it can occur at lower altitudes and, on rare occasions, at ground level. Astronauts, the only persons who get to see the lights from above, have flown through auroras and report that even with eyes closed, they see flashes of light from the charged particles as those particles pass through their eyeballs. The solar particles that react with Earth’s atmosphere to form the lights circle the geomagnetic poles, so the aurora borealis is usually seen in places above a latitude of 30 degrees. The land areas that see most displays of northern lights include northern ALASKA, the Hudson Bay region, ICELAND, and northern Scandinavia. Clear nights in these areas are dark enough to view the lights from September to April. Since the lights are brightest following solar storms, several websites provide updated forecasts of such activity. Following earlier research, scientists in 1957 and 1958—the International Geophysical Year—mapped an oval band, about 310 mi (500 km) wide, that circles Earth’s magnetic poles. Within this band, about 1,250 mi (2,000 km) from the pole, the aurora borealis can be seen on almost every dark night. Areas as far south as the New England portion of the UNITED STATES may see an aurora borealis several times during the year, but sightings farther south are rare. Very large solar storms have resulted in lights being seen far south of the usual viewing range, but this happens only once per decade, on average. An aurora in 1859 was observed as far south as Honolulu, HAWAII. 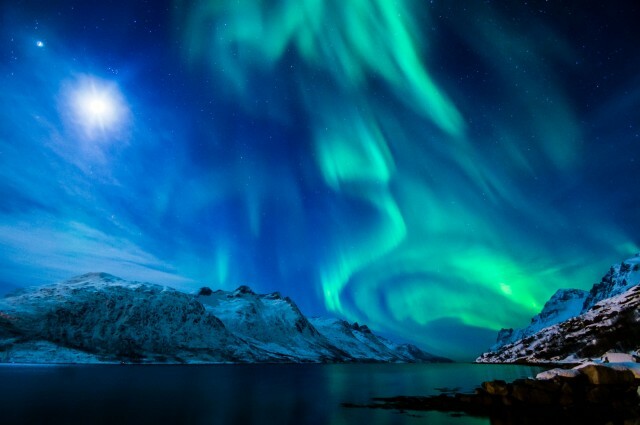 Observations of the northern lights date back to the time of Aristotle, who described an aurora around 349 B.C.E. A Viking record titled Kongespeilet (King’s Mirror), written circa 1250 C.E. states that the light blazes like a living flame. Poems by Samuel Taylor Coleridge, Robert Browning, and Sir Walter Scott, among others, have mentioned the aurora borealis; in the 1600s, philosopher René Descartes suggested that sunlight scattered from ice particles in the upper atmosphere was the cause of the northern lights. Astronomer Edmund Halley proposed in the early 18th century that the lights were caused by Earth’s magnetism. One hundred years later, in 1825, C. Hansteen indicated a link between the lights and geomagnetism. In 1860, Elias Loomis, an American, mapped out the distribution of northern lights geographically and showed that they formed a ring around the North Pole. In his 1881 work Das Polarlicht, Swiss physicist and engineer Herman Fritz extended Loomis’s research. Both men identified a correlation between the auroras and sun spots, noting that the lights grew stronger and weaker following the 11-year cycle of sunspot activity. In 1896, Norwegian physicist Kristian Birkeland showed with models that electrons from the sun would bend toward the Earth’s magnetic poles and enter the ionosphere, where they decelerated and emitted light. Current research shows that the electrons thrown by the sun generate currents as great as a million amperes. This was also proposed by Birkeland, but in 1896 the idea was ignored. A similar phenomenon occurs around the southern geomagnetic pole and is called the aurora australis.